I think it was a Fifty Linden Friday or a Saturday Sale special or something… but I have a feeling this offer won’t last long, so go grab a demo while you are there slapping that board for all that free hair! Categories: accessories, eyes, Free, gacha, group gifts, groups, hair, mesh, poses | Tags: 0L gift, 50L, 50L Hair, Alaksametro, Amitie, Besom, Cae, Catwa, Equal10, Euphoric, fab free, fabfree, fabulously free in SL, FLF, free in sl, Glam Affair, group gift, Love Trill, maitreya, Saturday Sale, Second Life, second life gift, sl, sl free, SL Freebies, UBER, ViSion, Whimberly | Permalink. Hey there Fabulouses! I know I don’t usually get all up in your face, but I have some really nice gifts to tell you about that require a close encounter such as this! In this blog post I’ll be featuring news about Euphoric and Besom, which all together will hook you up with eyes, eyelashes and hair for FREE! I am not sure how much longer this will be happening, but for the last week or so I have been visiting Besom daily to slap their Midnight Mania Board which contains different FREE hairstyles every day! This one is called Gypsy Love, and it’s so much fun with the fly away strands and sassy volumized waves. There is no group required, but you’ll need to get there early… it’s been locking down really quickly as these are FULL FATPACKS! Categories: accessories, eyes, Free, group gifts, groups, hair, mesh, midnight mania | Tags: 0L, 0L gift, Besom, Cae, Catwa, Euphoric, fab free, fabfree, fabulously free in SL, free in sl, Glam Affair, group gift, Love Trill, maitreya, midnight mania, MM board, Second Life, Second Life Free, sl, sl free, SL Freebies, sl gift | Permalink. Shouldn’t we love every day? Shouldn’t we love every day? I can appreciate a day of the year dedicated to love and mush and hearts, but shouldn’t we love every day? I’m going to keep the love going even today with some pink and red romance! 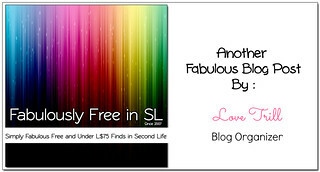 I am here today on FabFree to share news about a couple of amazing 50L offers for Fifty Linden Friday. Besom has a whole fatpack of this sultry hairstyle called Lara on sale for 50L until midnight tonight and Cae is offering the Initial Necklace and Bracelet for 50L each. The Initial Necklace and Bracelet come with texture change jewel and metal options so you can match them up with whatever you have on. This sweet romantic dress is Dead Dollz Amor Dress that is being featured at Belle in several colours with texture change gem and ribbon options! It is not a Fifty Linden Friday offer, however at their mainstore they are participating and also have a 50L dress today on sale until midnight that is gorgeous as well. Categories: hair, jewelry, mesh | Tags: . ::Dead Dollz::., 50L, Avi-Glam, Belle, Besom, Cae, Catwa, fab free, fabfree, fabulously free in SL, Fifty Linden Friday, FLF, Glam Affair, Love Trill, LW Poses, maitreya, Missing Melody, Second Life, sl | Permalink. I am not usually one for the “princess” thing. You know, the idea that I am incapable of taking care of myself, or that I am to be handled with kid gloves. Sometimes, though a bit of princess is ok. I’ll never say no to standing tall, wearing a crown and being sweet. Wait, did I just describe being a pineapple? Oh…well, never mind! My lovely, shiny and unique top is the most recent subscriber gift over at Promagic! Oh yes you guessed it, it’s completely free! Just click on the subscriber unit, then look in the history section and you’ll find it sitting there for you, ready to go! This gift is sized for Maitreya bodies, and I kinda love the little heart appliques on the back. Yay! I always love free hair (who doesn’t?) and KoKoLoRes is totes delivering. I meandered over there, and found their new group gift – this choppy bob with pink dipped ends (you guys know I love a bit of colour). It comes with a bunch of different natural root options in the HUD too. I joined the group for free and found this gift upstairs on the second floor of the shop. Get over there, y’all! Oh go on then, you can call me princess just for today. Categories: Free, group gifts, hair, mesh, shirt | Tags: Aline Passiflora, Besom, Blueberry, Euphoric, fab free, fabfree, fabulously free in SL, free, freebie, Glam Affair, Joplino, JUMO, Kokolores, lelutka, maitreya, ProMagic, Second Life, Second Life Free, Second Life Freebie, secondlife, sl, sl fashion, sl free, sl freebie, sl gift, sl style | Permalink. Have you been taking part in the Womenstuff Hunt? Juli showed you what she found HERE. I poked around at FurtaCor and I found this cool ripped dress. It only cost me one little Linden, and comes with an HUD with a several different texture options. Isn’t it cool? Head on over to FurtaCor and grab it! Categories: dollarbie (1L-3L), dress, hunts | Tags: 1L, Aline Passiflora, Besom, Euphoric, fab free, fabfree, fabulously free in SL, Foxcity, free, freebie, FurtaCor, Glam Affair, JUMO, lelutka, maitreya, Second Life, Second Life Free, Second Life Freebie, secondlife, sl, sl fashion, sl free, sl freebie, sl hunt, sl style, Sn@tch | Permalink. Today, I felt like going on a little journey through the grid. I’m feeling silly and fun, so why not wear something fruitty! The Baci Shop has just the dress, featured at The Cart Wash Sale, for only $10L. I saw this dress and thought it was adorably cute, so I was determined to have fun with it and just make it scream me! As I am sure everyone knows The Cart Wash Sale is in full swing and will be open until September 5th! All items featured at this sale are only $10L! The variety of items here is endless, we are talking clothes in all body shapes, furniture for all your home needs and so much more! It is definitely worth a trip over to The Cart Wash Sale, you never know what you are going to find! Categories: dress, events, fitted mesh, mesh, Uncategorized | Tags: 10L, Alme, An Lar Poses, Baci Shop, Besom, Catwa, dress, eBody, Euphoric, fabfree, Fabuloulsy Free in SL, Fruit, Hourglass, L'Etre, little paris, maitreya, Nevi, Neviana, Neviana Marshall, Nevimariecross, Physique, Reign, secondlife, sl, slblog, SLink, Standard, The Cart Sale, TRUTH, Veechi | Permalink.